DR Congo forward Lomana LuaLua has been told by Portsmouth manager Harry Redknapp that he must up his game or his future at the club may be at risk. Espanyol have been linked to the 26-year-old, who scored only two goals last season. However, Redknapp said: "LuaLua has got great ability but he has got to start producing next season. "He is a terrific player but the penny has got to drop with him. He has got to start performing." 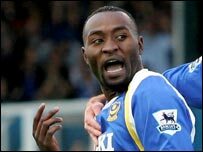 LuaLua, who played 24 games in total for Pompey in the 2006-2007 campaign, signed a new three-year deal in the summer of 2006. However, he was hit by an ankle and then a thigh problem and started only eight Premiership games. Redknapp added: "He gets well-paid, he has got a good contract. Now he needs to do what he is capable of. "He is a fantastic talent. He is a good lad, not a bad lad. He has just got to put all his energies into football." Meanwhile, Nigerian forward Kanu has not signed a new one-year deal offered to him by Portsmouth and is still holding out for a two-year contract. Redknapp, who is on holiday in Spain, confirmed: "I have not heard a thing from Kanu, whether he is going to sign or not."